Automatically feeds balls for all Zooka pitching machines. Controlled and powered by the pitching machine. Pitch interval approx. every 6.5 seconds. Holds 16 baseballs or 18 tennis balls. Allows solo batting practice or coaching at home plate. Also useful for tennis practice. 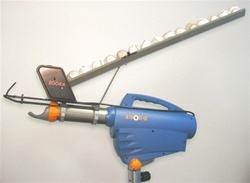 This is a must have for the Pitching machine. I've loaded up about 17 balls, then let the machine go auto feed..., which allows me to coach my son standing right next to him during batting session.